Dear friends, followers and supporters alike! About two months ago, when working this years Beer and Whiskyfestival in Gothenburg (for Edrington), I passed by the stand of Smögen Distillery to have a chat with Pär Caldenby, the Master Distiller and Distillery Manager. I wanted to see if he had anything that he wanted me to review, and indeed he had! Pär gladly shared a sample of his coming release: this time around it's a single (oloroso) sherry hogshead (250 litre) made from american oak. The new-make was filled on the 23rd of October in 2011 and the whisky was bottled on the 18th of March 2018, hence making it 6 years old. The cask number is 51/2011 and the cask gave 422 bottles at cask strength 64% ABV. Now, what is very special indeed about this whisky is the fact that it has been crafted using local barley! On the FB-page of Smögen Distillery Pär writes that the malt used is made up of "barley grown on the farm, literally speaking beside the threshold/door to the distillery". This will be very interesting folks! Here in Sweden 276 bottles will be released as a so called web launch this thursday (the 31st of May) and you can view it by clicking here. Ok, let's see what we have here! When nosing close but carefully, the whisky appears very creamy in a calm sort of way. The peat is soft with a mellow briny-ness to it in turn mixed with fudge-y and rasin-y notes. The rasins somehow also makes me think of orange peel, very soft vanilla infused orange peel. When nosing harder I actually detect cinnamon (finely ground) together with something exotic best described as a combination of dried clementine peel and dried lime peel respectively. The core stuff on the nose is composed of creamyness, soft peat, cinnamon, and citrusfruits. All in all this is indeed a ”soft” dram on the nose, and it is not until I nose harder that I really think about the fact that the strenght actually is 64% ABV. Ooh! Very unexpected style in this one for being Smögen! It starts off with a lot of salty-ness (this is of course, as I see it, expected from Smögen) but then, instead of turning into raw sugar syrup-sweetness as sherry matured Smögen usually does, it very swiftly changes into… (wait for it…) sun warm and ”sour” slightly underripe redcurrants plucked straight from the bush. Then a tad of yeast shows up for about half a second but after that quickly turns into a lot of barley (in fact almost oatmeal porridge without milk), very dry barley together with chopped up almonds with traces of fudge. Well that was definitely a journey of flavours! In the early aftertaste I find that the redcurrants rise in my mouth together with the ”alcohol vapours” and turns into some kind of ”red” fruit, not really red wine, I think it is rather something like rose hip. The aftertaste ends in almondpaste, salty-ness and soft peat. Such a cool taste! 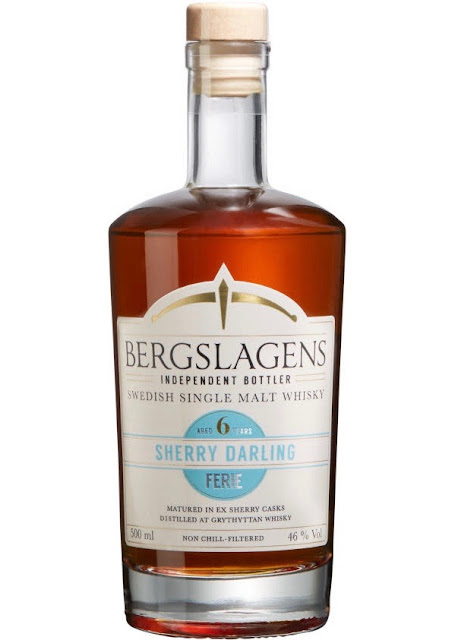 For me, this whisky is not really what I expected from a single sherry cask Smögen; as mentioned the core stuff on the nose is creamyness, soft peat, cinnamon, and citrusfruits, which for me are more usual stuff from bourbon casks (especially the creamyness and the citrusfruits), maybe it’s the american oak that plays a trick on me (?!). For me, the taste does not really contain ”classic sherry stuff”, but I suspect that the fresh redcurrants, and the ”red” elements in terms of the rose hip are actually in this case the main flavours that originate from the sherry that was in the cask before the whisky. All in all I think that the local barley that was used for this one really has put its very unique signature on this one, and for those Smögen fans out there that want to taste a new element to the Smögen distillery character should definitely try this one! Big thanks to Pär for the opportunity to try this release, and to be able to review it before the web launch. Please make sure to follow my FB-page by clicking here, my instagram by clicking here and my twitter-page by clicking here. Copyright © and All Rights Reserved on all tasting notes and text by SamuelWhisky and pictures likewise belong to SamuelWhisky, unless stated. If you would like to use any such material that belongs to SamuelWhisky or associated with SamuelWhisky, please ask by sending me an email to samuelkarlssonorebro[at]gmail.com and by stating the source.